on the last Sunday in May, in the village of Yamanakako, Yamanashi Prefecture. The marathon course goes past places that has a good view of Mt. Fuji. So it was held on yesterday! 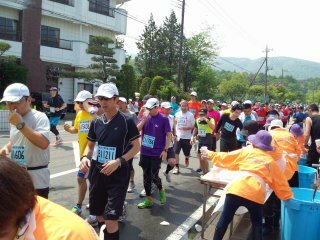 More than ten thousand people entered this marathon race. Copyright © Rosy Posy All Rights Reserved.